Seen here, the Bass leg on the Blüthner Style-X – I had just started fine-tuning the new leg boss to mate properly with the new leg. Quite a long process of test fitting, then removing fine shavings until everything is snug. Please look here for a picture of the legs and lyre fitted – I was double checking to make sure there would be enough clearance under the lyre. The new soundboard arrives at 12 noon! 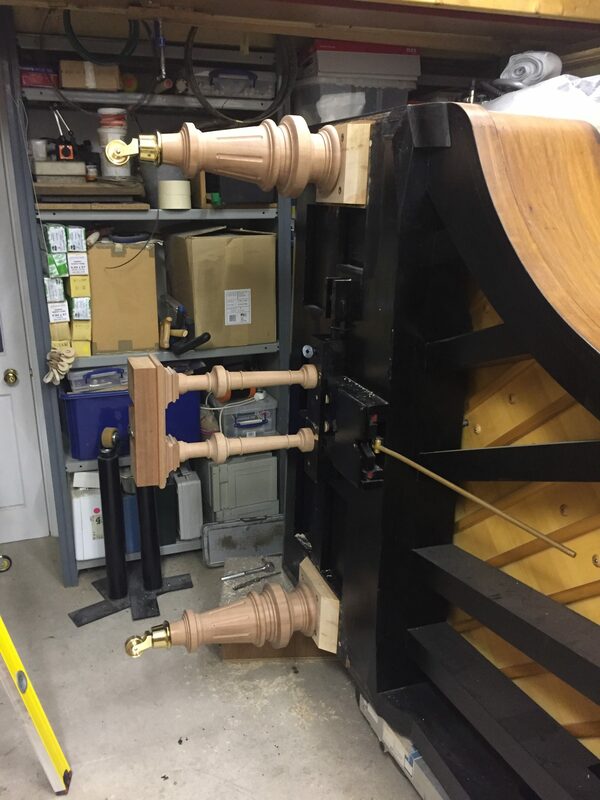 The case is all prepared – the bracings have been cleaned and lacquered, the slips (the area that the soundboard is glued to) cleaned, and the new polyester wrapped up for protection during the work. Todays work will mainly involve fitting the board to the case – tomorrow the bridges (three of them on this piano) will be positioned, bearing set etc. Last job of the day will be varnishing the underside of the board ready for it to be glued into the case the next day. Rough cut Maple to build a new bass bridge for the Blüthner Style-X. Seen here just before the top piece was thicknessed to produce a bridge of the correct height.